Meet the Ashton, a smart single story floor plan that is sure to please. Before you enter the Ashton, you are greeted by a covered front porch. Inside the home, the first thing Ashton offers is a formal foyer. Off the foyer there is a flex space that can be left open to the great room or can be closed in with double doors to make a den. The great room is completely open to the kitchen with its large center island and large 14’x11’ patio that can be covered as a lanai. 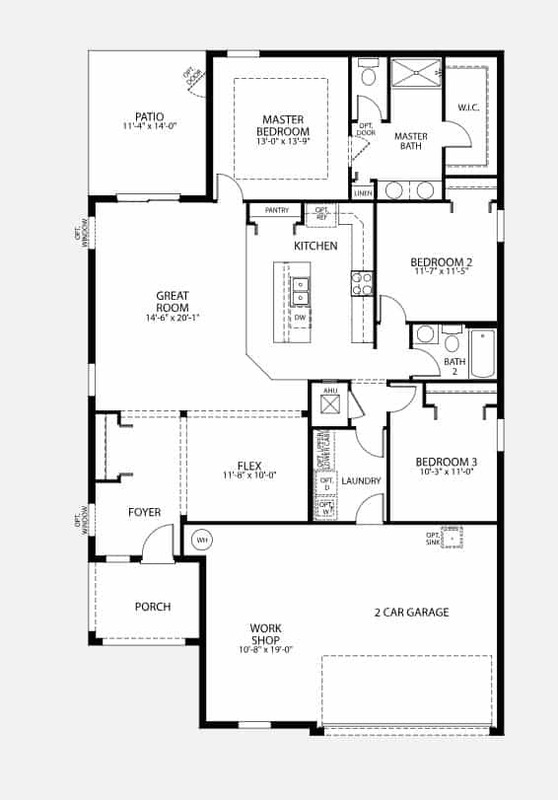 The split floor plan offers separation between the master bedroom and the other 2 bedrooms. The master suite offers a private master bath and large walk-in closet. The laundry room features cabinetry for storage and organization and a pass through to the spacious 2 car with workshop or 3 car garage. All these features are found in a home that can fit on numerous lot sizes.